It only comes in one size and it is "large". The charms shown are: Square Blue Crystals, Ribbon Charm, White Bicone Crystals, Heart Flag charm, Red Square Crystal, Picture Frame Charm, Blue Bicone Crystals, Praying Boy or Praying Girl Charm, White Square Crystals, Filigree Mom Charm and a Red Bicone Crystal. 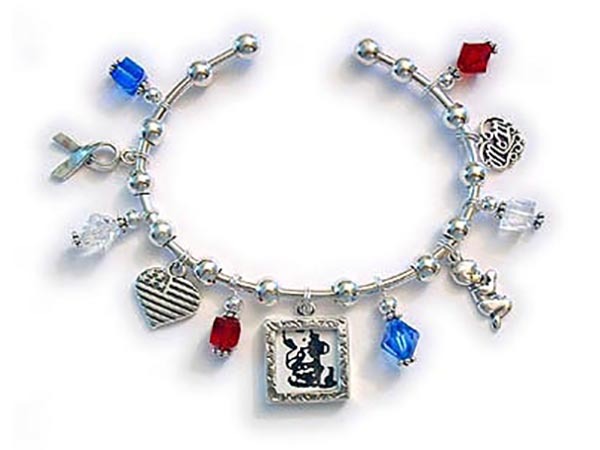 This Bangle Charm Bracelet has a lot of beautiful Red White and Blue charms. Everything is .925 sterling silver or Swarovski crystals. It only comes in one size and it is "large". The charms shown are: Square Blue Crystals, Ribbon Charm, White Bicone Crystals, Heart Flag charm, Red Square Crystal, Picture Frame Charm, Blue Bicone Crystals, Praying Boy or Praying Girl Charm, White Square Crystals, Filigree Mom Charm and a Red Bicone Crystal. This bracelet (and all my bracelets and necklaces) can be further personalized. Just call or text me 615-490-2177 with questions or to place your orders.